Suddenly. Life has changed again. I’d just got used to it. I’d got lulled into a false sense of security. I thought I had it down. Just as I almost had a grip on this I-made-a-baby-and-now-I-need-to-look-after-it-malarki – BOOM. Like a giant tidal wave of turd; the parenting under lords washed away any confidence and smugness I ever felt towards my mummy abilities by showing my daughter how to crawl. As ever, I feel it’s time for some of my clearly ever-so-helpful parenting tips. WallyMummy style. So prepare for bad language, booze and tears. Make the travel cot a permanent fixture in the centre of the living room. Not for the baby. For you. This will be your new and only sacred place left to cry. And occasionally eat. Don’t bother protecting all the corners of your furniture off, simply strap a pillow or helmet to your baby’s head and/or face. Everything at knee level is now at risk of elimination. Remove all your books, magazines, DVDs, ornaments and picture frames and replace with husband’s possessions. Superglue their toys to the playmat – that’ll mess with their tiny minds. No matter how much you think you’ve baby-proofed and child-locked your cupboards they will always find bleach to drink and a saucepan to wear as a face-hat. There’s nothing for it – you’ll just have to give up cooking and cleaning. When making a toilet trip at home or out and about, gaffa tape your baby to the nearest heavy object or attach a short leash. Attach a basket to baby’s back and make them carry their own f*@king toys around for a change. Wave goodbye to your pets. Now my child has an adaptive ‘chase’ mode, my cats haven’t been seen during day light hours since mid-August. Remember when you could sit down, leave them to play on their own for a while, leave them sat in their buggy with some toys perhaps? Well that’s nice. Because that’s all it will ever be now… A SHITTING MEMORY. Better go. As I type my daughter has made her way across my living room, pulled out the entire contents of the changing bag, which she is now wearing whilst eating a nappy and attempting to use the plug-socket as a finger glove. It. Amidst its trail of destruction. LOL! I remember it well. A tip for you, set aside one low cupboard in your kitchen in which you have tupperware or plastic pots/boxes, a couple of wooden spoons, a plastic spatula, a stainless steel mixing bowl and occasionally, add a box of raisins, a pot of cheerios, or a toy. Say 'NO' firmly and stop her getting into any other cupboard but let her play in that one. She'll soon realise that letting Mummy cook lunch/dinner while playing in 'her' cupboard is fun. About moving things up, I didn't bother. We used NO and we meant NO. My boy soon got the message. When we added a daughter to the mix, we had to change all our thinking because instead of being able to focus on just one child and prevent accidents/problems, our attention was split and she'd get into EVERYTHING. If all else fails, get a staple gun and staple her clothes to the floor. That'll keep her in one place. LOL I remember this stage so well. When new mums complain to me how hard dealing with a newborn, I can't help but suppress a smirk. Newborn stage is by far the easiest you will ever have to deal with! Yes I don't know what I ever complained about before lol! Oh damn I'd blocked out this memory of Cian and now Fifi is on her tummy and rocking and rolling don't think it'll be long before I'll be needing your tips. This is a BRILLIANT post. Funny, well written …and so true. After a 3.5 year gap it's back to Babydom for me shortly – and this has been a pertinent reminder of all the things I'd forgotten! Oh man! 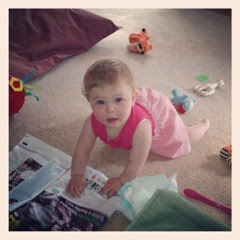 I have twins, I've been 'naively' been looking forward to the day they start crawling! Better buy a travel cot! Love your blog!